This post will update you with yesterday's (Wednesday) and today's spoilers for Gatecrash. 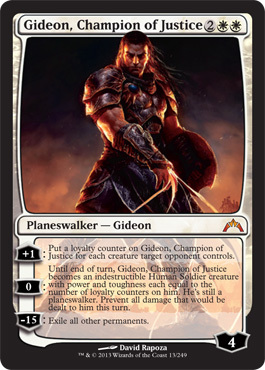 We have our second planeswalker, which was already confirmed as a new version of Gideon. But we'll get to him... Lot of ground to cover, so here we go! 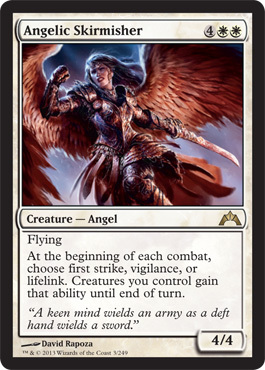 First up, we have Angelic Skirmisher. For 6 mana, you get a 4/4 creature with flying, and you can choose either first strike, vigilance, or lifelink at the beginning of each combat, which means all of your creatures get that ability for that turn. If you had three of this card, you could give all your creatures these abilities. 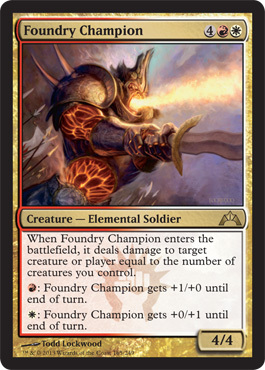 Already seeing some great Commander stuff I could do with one, and some neat stuff for Standard. 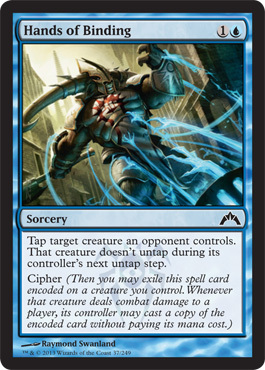 Hands of Binding, our next card, lets you tap target creature that an opponent controls, and it won't untap during it's controller's next untap step, yet you can encode this on a creature you have with Cipher. Despite this clearly being Dimir, I think this would go very well with Detain from the Azorious. Maybe. Still, for two mana, this looks good. Skarrg Goliath is a 9/9 with trample for 8 mana. Or just a 7 mana pump spell that gives +9/+9 and trample. 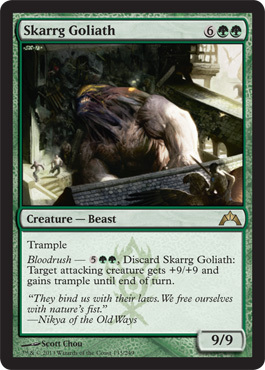 I am really liking Bloodrush, but perhaps it will wind up similar to Golgari's Scavenge. Is Bloodrush worth it? Probably in Commander/EDH, but I don't know about in Standard. Especially this card. 7 or 8 mana. The typical rule of thumb is if you can't do anything well enough by turn 6 or 7, you probably won't win or do very well. Assuming you play one lad every turn, this comes on turn 7 or 8. And with 20 to 24 land in your deck, chances you won't get to 7 or 8 mana when you want it, and there will be tons better stuff you'll want to throw out (Thragtusk?) I don't see this one being used very much. 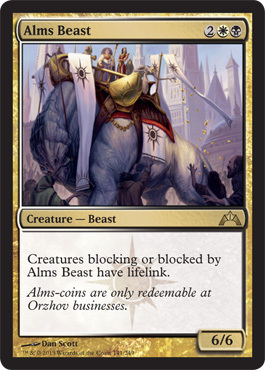 Alms Beast, for 4 mana, is a 6/6 that gives blocking or blocked creatures by Alms Beast lifelink. So if you block a creature or are blocked by a creature when using Alm's Beast, that other creature gets lifelink. Not feeling so great about this one, but there is probably a stupid combo here I haven't seen yet. Just hope it is a 5/5 or less. Preferably less. Biovisionary is a bit strange. 3 mana for a 2/3. 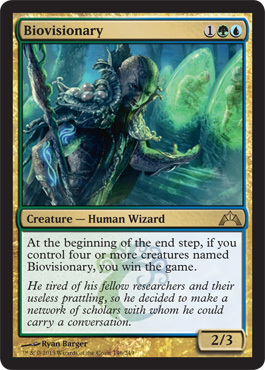 At the beginning of your upkeep, if you control four or more creatures with the name Biovisionary, you win the game. If someone plays this, expect removal. Either there is something coming out in Gatecrash, Dragon's Maze, or sometime in the next block that will give you tokens that are copies of a creature for you to have more than 4. This will be difficult, but I bet someone will figure out a way. Either that, or this was made for Modern or Legacy. 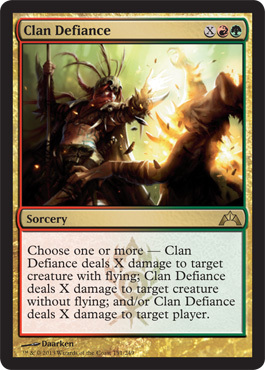 Clan Defiance is a Devil's Play (Innistrad) for one more mana and it comes with options. 2 mana plus X mana to deal X damage to a creature with flying, to a creature without flying, and/or X damage to target player. You can destroy a creature with flying, without flying, and bring the game closer to an end that favors you. Bonfire of the Damned (Avacyn Restored) was amazing, and jumped in price., but this is not all creature and the player, but the player and either one or two creatures. Pretty good, either way... Bottom line, yeah, this is powerful, so expect the price to skyrocket. Our first Guildmage, from the Simic guild, we have the typical two mana of different colors for 2/2 with two abilities making Zameck Guildmage. So for one green and one blue mana, you can give each creature that enters the battlefield under your control an additional +1/+1 counter. The other one has the same cost, but lets you remove one +1/+1 counter from any creature you control, and you can draw a card. Not bad. 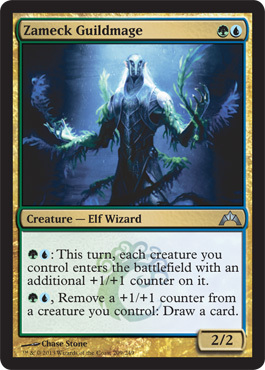 I'm looking forward to Simic, for sure. 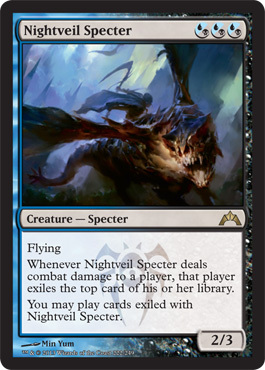 Nightveil Specter, for 3 mana to make a 2/3 with flying, lets us exile the top card of a player's library if it deals combat damage to them. And we get the added bonus of getting to play cards that are exiled with Nightveil Specter. By play, since it doesn't mention paying a casting cost, I assume that it can just come into play under your control. 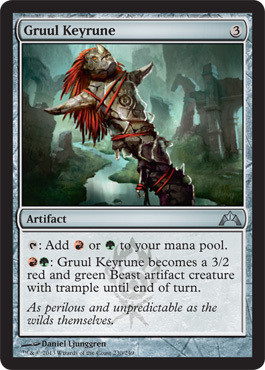 Last, but not least, we have our second keyrune, Gruul Keyrune, which like all other keyrunes thus far, costs 3 mana, produces one of two colors, and then for one mana of each of those colors, you get a creature. So it makes either red or green mana, and for one red and one green, it becomes a 3/2 red and green beast artifact creature with trample until end of turn. I expected the trample bit. Quick note: promo cards (pre-release, buy-a-box, game day, release day) will show up on the blog Monday, as will Friday's card preview. Unless Friday will have Friday's preview, but I can't be certain about that. I hope you have enjoyed the spoilers thus far!